Mussels, farmed at Prince Edward Island, Canada has dramatically improved the ability to buy and enjoy these delicious bivalves. At one time, the required scrubbing and beard removal made them an occasional treat. Today, It’s simply out of their net bag, a quick rinse and search for the occasional beard and they’re ready to add to the steam pot, the cast iron skillet or the grill. After the desired preparation, five to eight minutes later the these delicious morsels are on the table. 1. In a large stock pot, combine the Lime Juice, Coconut Milk, Wine, Curry Paste, Garlic, Fish Sauce & Sugar. Stir to dissolve Sugar & Curry Paste & bring to a boil over high heat. Boil for 2 minutes, then add Mussels. Cover & cook, stirring occasionally, until Mussels have opened, 5 to 8 minutes. 2. Remove from the heat & discard any unopened Mussels. 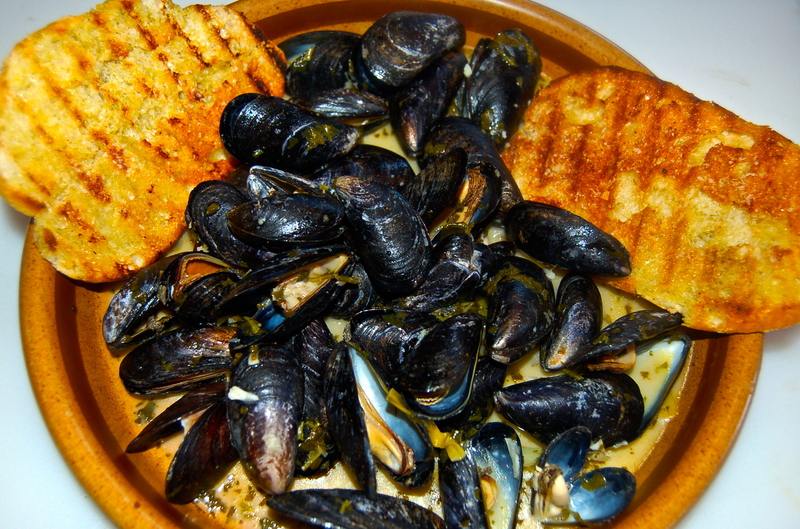 Pour Mussels & liquid into plates or a serving dish & toss with Cilantro. 3. A grilled baguette with EVOO is delicious for mopping up the sauce.